AtlasIED Launches New Audio Solutions at ISE 2019 to Meet the Most Demanding Commercial Environments ﻿ | KMB Communications, Inc.
Phoenix, AZ – (January 29, 2019) – AtlasIED— a global manufacturer of comprehensive audio solutions for commercial business environments, will showcase a range of new products that emphasize aesthetics, functionality, and exceptional audio fidelity. Supported by the experience and enthusiasm of AtlasIED’s newly expanded sales and marketing teams, the company will debut innovative new loudspeaker lines, sound masking solutions, and more at Integrated Systems Europe (ISE) 2019 in stand 6-K160. Building upon 80-years of experience in audio technology, AtlasIED’s latest offerings are engineered to meet the most common challenges in today’s commercial installations. Designed specifically for the business, retail, corporate, healthcare, and educational markets, the new Z Series of sound masking products and the SHS Series of speakers, along with the IPX Series of IP Endpoints, fill important niches for integrators and offer the features that today’s businesses and institutions need to stay on the cutting edge of audiovisual technology. The first-of-its-kind concealed design of the SHS is achieved by Adaptive Dispersion Lens Technology, a new, patented waveguide form. Only a 3-inch diameter lens and a micro trim ring are visible on the ceiling. The dispersion lens can be easily painted or replaced with material to match the ceiling, allowing the SHS to blend in without compromising the architectural aesthetic of the room. Designed to deliver highly intelligible audio, the speaker has a 2-way driver providing high-definition sound. Sound exits the two-way transducer and passes through the patented adaptive dispersion lens for a smooth and uniform frequency response with no “hot spots” common to some loudspeakers. The speaker uses an integrated 32-watt 70V/100V transformer with a sealed enclosure above the ceiling for optimal bass response, and offers ultra-wide 180-degree dispersion for full coverage in any environment. Easy to specify and install, the SHS Series speakers include three dispersive lens configurations for enhanced flexibility and functionality in any room, regardless of ceiling height. Thanks to their slim profile and thoughtful design, the SHS Series speakers already seem to vanish into the ceiling of any installation. For hard-to-match environments, AtlasIED’s DesignLab™ custom print process uses an incredibly accurate UV-printer to replicate colors, textures, and patterns, enabling the SHS to blend into any environment. Simply upload an image, provide a numeric color specification, or send a 6-inch sample of the ceiling tile to be matched, and the experts at AtlasIED will do the rest, delivering perfectly matched SHS lenses for any project. AtlasIED also reveals the IPX Series IP Endpoints to the international market for the first time. 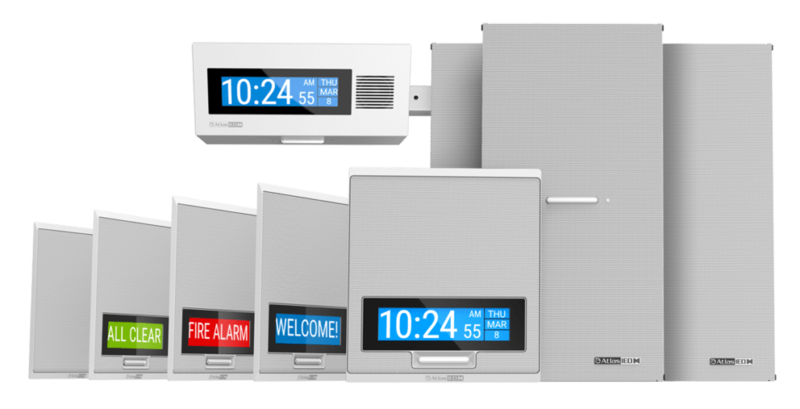 Tailored to the K-12 educational and healthcare markets as well as other facilities requiring a robust, high-tech communications system, the third-generation IPX Series ensures quick and efficient notification through audio and visual messaging. Available to ship, the IPX Series is being hailed as the perfect solution for expanding VoIP or SIP communications systems by integrating endpoints to offer greater coverage than traditional handset-based systems. Meet the AtlasIED team and explore the audio advancements available now to the international market at Integrated Systems Europe in the Amsterdam RAI stand 6-K160 February 5 – 8, 2019. Attendees are also invited to join AtlasIED for a reception celebrating the company’s new lineup on Wednesday, February 6 from 16:30-18:00. Learn more at www.atlasied.com. Follow AtlasIED on Facebook, Twitter, and LinkedIn.